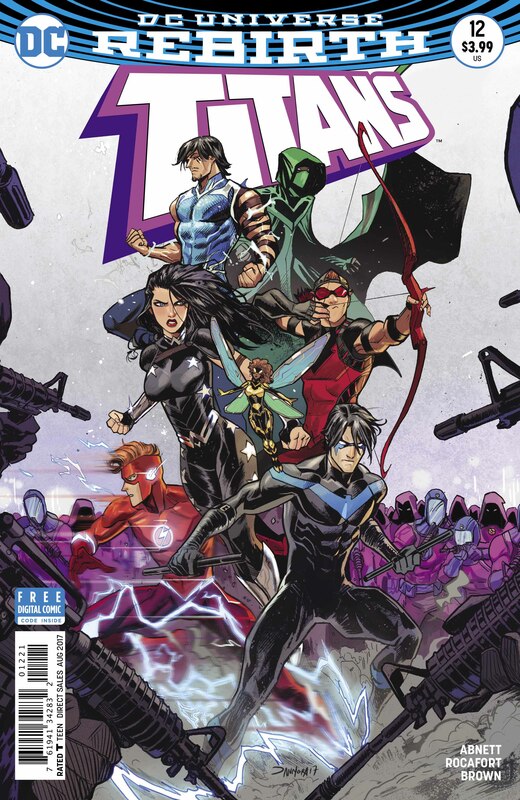 Coming fresh off the heels of “The Lazarus Contract,” Titans #12 is something of an interesting issue. 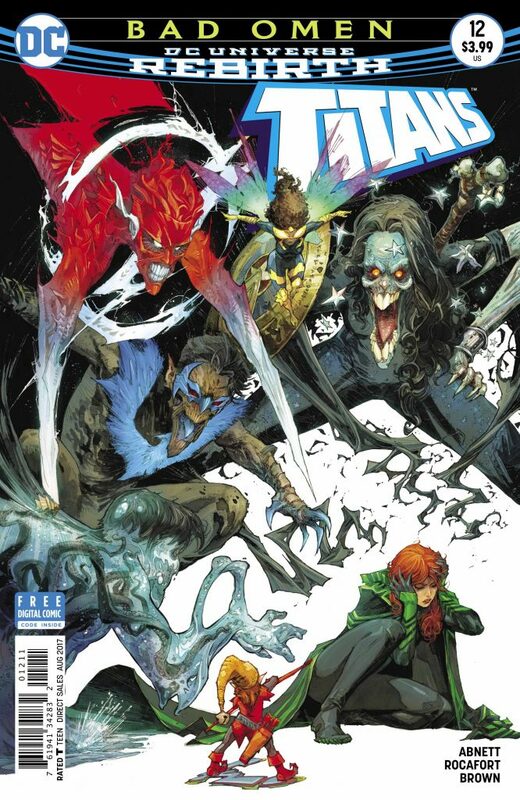 After the intense epilogue we saw in the pages of Teen Titans Annual #1, I was expecting a follow-up issue that maybe led into the next big arc whilst also addressing what had happened (Wally getting a pacemaker). While I did get one of those things, the other just wasn’t there. Obviously, I am referring to the fact that this issue is just here to push the story forward and prelude the next arc – and don’t get me wrong, that’s not a problem, it’s just that there are only two or three references to anything that happened in “The Lazarus Contract,” and that didn’t sit right with me. 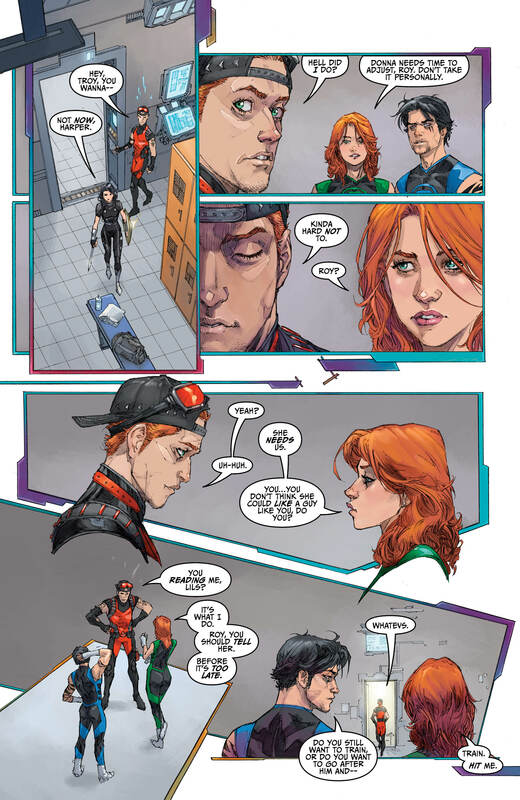 The events of that crossover played heavily onward in Deathstroke #20, and it looks as though Teen Titans #9 will be doing the same, so it confuses me greatly that Titans is continuing like nothing happened. All of that aside, I did enjoy this issue. 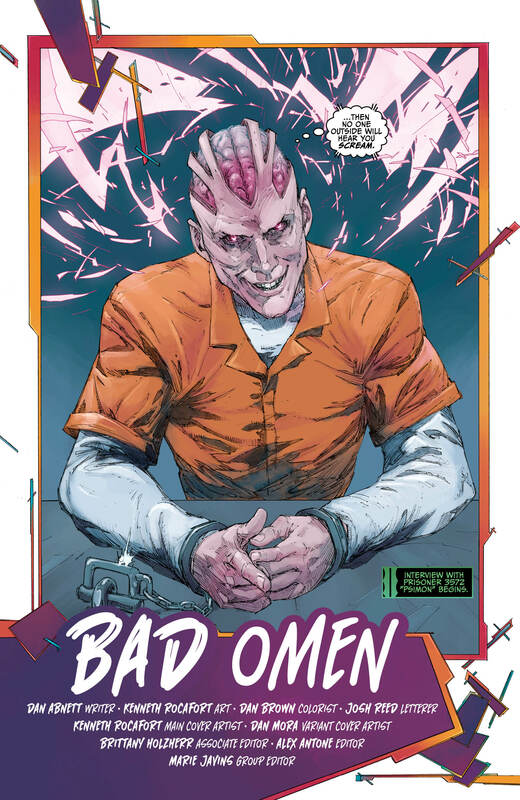 It was something different, and I was happy to see an issue almost entirely dedicated to not only Omen but also Psimon. 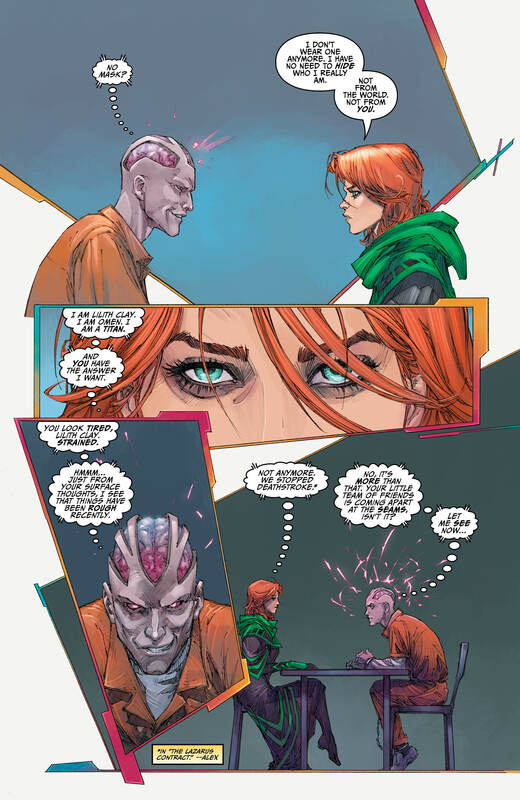 The general idea was simple: Omen was confronting Psimon for answers – she wanted to know who Psimon sent Karen’s memory engram to. Honestly, I had forgotten about that. 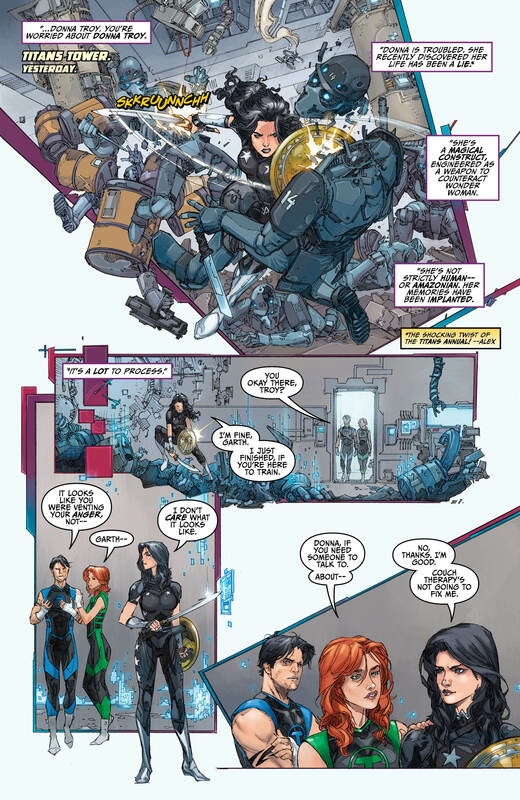 With everything going on during this latest crossover, part of me even forgot Karen existed in this book, which I guess is why having her as the entire focus seemed odd to me. Well, using Omen as the focus but having it be revealed to be Karen. Ultimately, Omen gets her answers and actually takes Psimon down a peg, revealing that she is more powerful than she lets on. This was a pretty cool moment honestly. 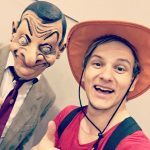 The issue contained a lot of good moments, but as a whole, I just craved something…more. 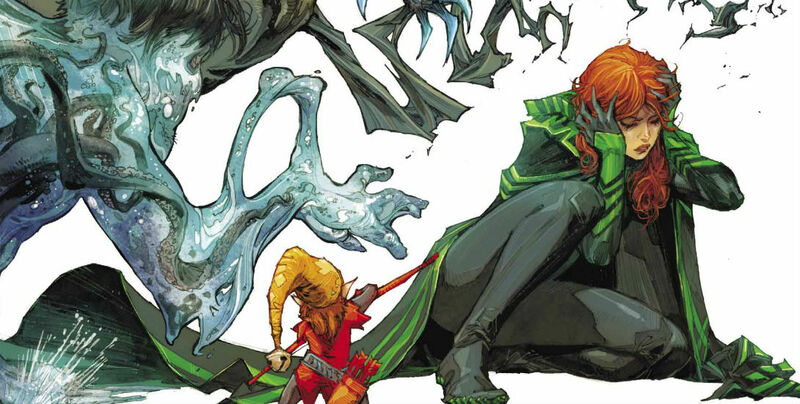 The art in this issue was chillingly good, and we have Kenneth Rocafort to thank for that. 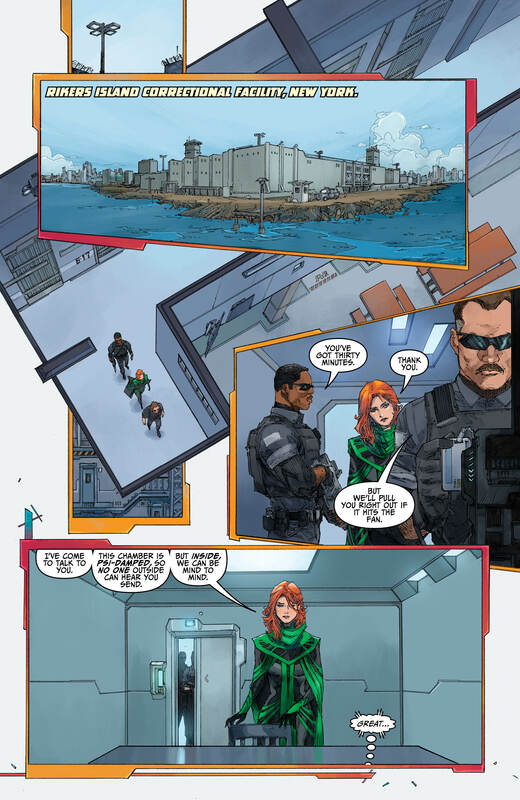 Along with Rocafort, we have Dan Brown on colors and Josh Reed on letters – a small but effective team. This issue was the first time I’ve ever been even slightly creeped out looking at Psimon; he looked so hyper-realistic at some points and it was terrifying. Omen looked exceptional too – as did the rest of the team. I may have had my issues with this issue, but all in all, I did still enjoy it. 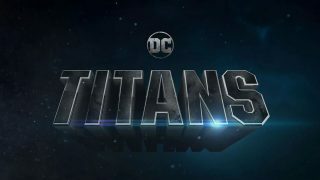 While Deathstroke went more for the epilogue approach after “The Lazarus Contract,” Titans came at this issue more as a prelude to what’s to come. That being said, this issue could be a great jumping on point for new readers who maybe checked out the crossover and want to get into this book. 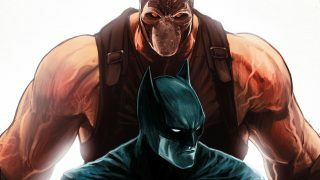 An issue that I can sit back and say “I’m glad I read that – but I probably wouldn’t go back.” It was enjoyable to read and look at, and I am interested to see what this upcoming arc is going to be like.